Sorry for the utter lack of news lately. To make it up to you, here's a brief rundown of what's new in our bleak little corner of the world. 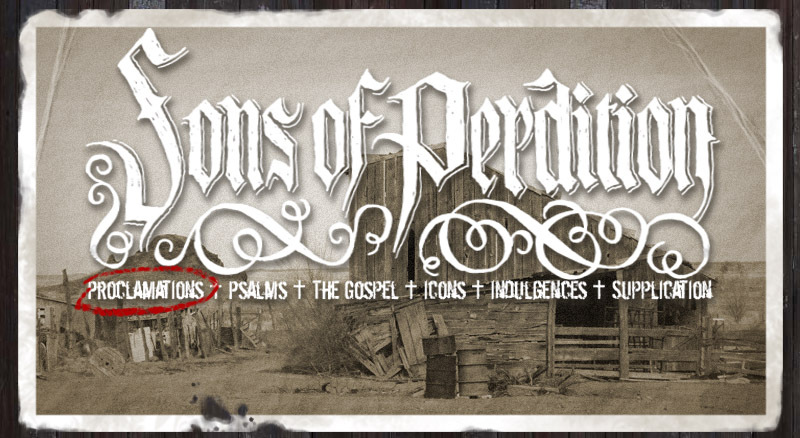 I've largely completed work on the revised Sons of Perdition website. I'm not putting it online until it's done, but it's gonna be a real beaut. I'm still recording material for our second album. Working on it is depressing the holy hell outta me, so that's encouraging. It oughtta be a bitter pill for your fevered soul to choke on. If you haven't noticed, we've relocated to the northwest corner of Arkansas, near Fayetteville. If you know any like-minded musicians, send 'em our way. Be comforted that all is not well in the world, nor should it be. Christoph Mueller recently drew a great picture of a dissected head in a glass jar for us with the phrase "Leave no flowers on my grave" written at the top. This was the title of a Sons of Perdition song that was originally recorded for "The Kingdom is on Fire" but ultimately discarded. It was decided that a song about love had no place on an album concerned with the holy. Trust me on this one. Rather than let this little song continue to rot where I buried it, I've uploaded it for you kindly folks to listen to and decide for yourself. It's not our best work, but I think you'll agree that it's far from our worst.